POSTED: Tue, 03/01/2016 - 17:00 | POSTED BY: Traci C.
Disney Springs is quickly becoming a go-to destination for high-end shopping and dining. And now, Disney has announced that 30 new tenants are coming to Disney Springs this spring including kate spade new york, Sephora, Lacoste, and more. Disney Springs is home to four neighborhoods: The Landing, Marketplace, West Side, and Town Center, and they're all connected by The Spring and a lakefront. 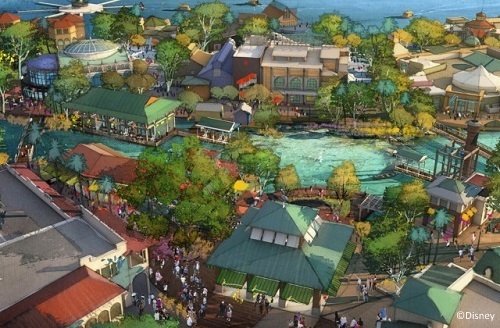 The entire area is inspired by Florida's waterfront towns. The Town Center will soon be home to 28 new stores including: Anthropologie, Sephora, Under Armour, MAC Cosmetics, Vince Camuto, Vera Bradley, Oakley, Coca-Cola Store, Trophy Room, Alex and Ani, Volcom, Kipling, UNOde50, Melissa Shoes, Everything But Water, Sperry, and Luxury of Time by Diamonds International. Several new restaurants are also coming to Town Center including D-Luxe Burger, a Disney-owned and operated gourmet burger restaurants and Amorette's Patisseire, a Disney-owned and operated high-end bakery serving up custom pastries and champagne by the glass. Tablas Fronteras, the new Mexican restaurant from Chef Rick Bayless and Homecoming: Florida Kitchen and Shine Bar from Chef Art Smith are also coming to Town Center. These stores are slated to open in phases beginning May 15. Fulton's Crab House is set to close this spring for a "bow to stern" refurbishment and when it reopens guests can enjoy a new rooftop lounge, an outdoor waterfront bar with a build your own fish boil on the menu, and a new menu that will feature Florida stone crab and Alaskan King Crab. And finally, the Bibbidi Bobbidi Boutique is moving from the World of Disney to a new location new Once Upon a Toy in the Marketplace neighborhood. What are you looking forward to on your next visit to Disney Springs? Let us know in the comments. I'm super excited about the new additions, especially Tablas Fronteras, and Homecoming: Florida Kitchen and Shine Bar. Rick Bayless is my favorite Master Chef! As someone who has to drive two hours to get to a real mall, I'm happy about the additional retail. The area that I live in really doesn't have anything like the stores that are going into Disney Springs and it's exciting to me to be able to do some fun and unique shopping in a beautiful environment.